Large 11 1/2" X 10" deluxe fraternal albums available in a variety of colors. All books come complete with appropriate pages for each organization. Also included are 4 Guest Pages, 4 Acetate Photo Pages, and 8 Plain pages. Page size 11" X 9". Extra pages are available for plain pages, guest pages, & photo pages. A protective clear plastic jacket is also available. 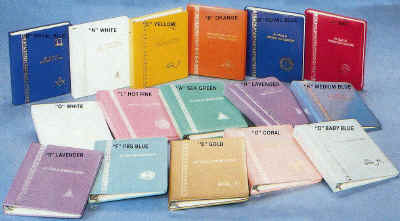 Several titles are available, which will be embossed in silver or gold, whichever goes best with the color you choose. Special titles may be had for $5.00 per line extra.